Eastwood Mall was one of the earliest American shopping malls and the first enclosed mall in the Deep South. When it opened in 1960, it was the nation's third largest (after Southdale Center in Edina, Minnesota (1956) and Big Town Mall in Dallas, Texas (1959). The mall was located at the intersection of Crestwood Boulevard (U.S. Highway 78), Montevallo Road, Montclair Road and Oporto Road in the Eastwood section of Birmingham. It was developed by Newman Waters, Sr, owner of the Waters Theater Company, adjacent to his Starlite Drive-In. 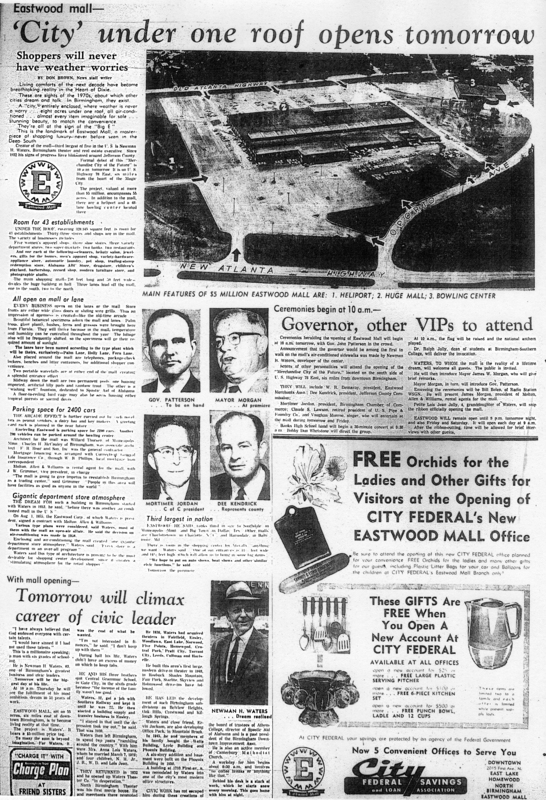 Eastwood Mall opened its doors at 10:00 AM on August 25, 1960, with 43 stores. Its initial anchor tenants included J. C. Penney, three supermarkets and a five-and-dime. The 48-lane Eastwood Lanes bowling center and a heliport were built on outparcels. Early advertisements for the mall boasted of its "Air Conditioned Sidewalks" and that it was "The Merchandise City of the Future". It was constructed for an estimated $5 million, enclosing 7.35 acres (320,345 square feet) of a 55-acre site, with space for 2,400 parked cars. The mall buildings were designed by Willard Thorsen of Minneapolis, Minnesota (designer of the 1956 Apache Plaza Shopping Center in St Anthony Village, Minnesota) with Charles McCauley as the associated local architect. F. R. Hoar & Son was the general contractor. Molton, Allen & Williams served as the original leasing agent. The "mall" referred to in the shopping center's name was the 50-foot wide by 275-foot long interior passageway that bisected the building from east to west and was lit by regularly-spaced narrow skylights. Three secondary passages led to mall entrances on the north and south. Containers were planted with tropical foliage, with palms, hollys and ferns helping distinguish the three entranceways. Two large pools occupied the center of the main passage (one containing fish and lilypads, the other raising funds for Spastic Aid of Alabama. Smaller fountains were placed at each end. A floor-to-ceiling birdcage housed either tropical parrots or sacred doves. Telephone banks, benches, package-check lockers and wastebaskets completed the furnishings. The opening ceremonies were attended by Governor John Patterson; Dee Kendrick, president of the Jefferson County Commission; Birmingham mayor Jimmy Morgan; Mortimer Jordan, president of the Birmingham Chamber of Commerce; W. R. Demaray, president of the Eastwood Merchants Association; James Morgan, president of Molton, Allen & Williams; and Claude Lawson, former president of U. S. Pipe and Foundry. Bill Bolen of WSGN-AM served as master of ceremonies. Ralph Jolly, dean of students at Birmingham-Southern College, delivered the invocation. And Lois Jean Jolly, Waters' 4-year-old granddaughter, cut the ribbon. Entertainment was provided by the Banks High School marching band and singer Vaughan Monroe. A major expansion of the then-three-year-old shopping mall was announced in 1963. Marshall Haynes, Jr of Molton, Allen and Williams credited the mall with having a "healthy influence on other shopping areas...causing competition to remodel and to consider Mall-type structures." Anchors that have been connected to the center over time include Parisian, Pizitz, and Yeilding's. For quite some time, the mall was unique in that it had two cafeterias under the same name and management, one at each end of the mall; Barber's Dairy was the original owner, who later sold out to Britling Cafeterias, who themselves sold one location to Pioneer Cafeteria and closed the other. Two other long-time restaurants at the Mall were the Holland House located in the original Michael's spot across from Kresge's and Pasquales located adjacent to Winn Dixie down by the Mall Theatre. Above the west end of the mall was office space, rented out for several years to a division of Rust Engineering. An Aeromarine boat dealership, and a small amusement park with miniature golf called Funtown were located across the parking lot from the west end of the mall. A go-cart track was located in the parking lot on the east side of the Mall. It was demolished as part of the 1966 expansion. A movie theater opened on Christmas Day 1964 and was equipped to show Cinerama movies such as 2001: A Space Odyssey and Ice Station Zebra. The Mall Theater was the site of the premiere of the 1976 film Stay Hungry, which was set and filmed in Birmingham. Then unknown actor Arnold Schwarznegger attended the premiere. At the time of its 1966 expansion to 70 stores, Eastwood Mall was believed to be the largest enclosed mall in the Deep South. Parisian built a new 35,000 square-foot anchor store at the mall in 1969, it's fourth branch to open in six years. Architect Brandon Crawford designed the store with a low-slung modern appearance. In 1967, Newman Waters sold the property to the Alabama Farm Bureau (today known as ALFA), which owned the property until the mid 1980s. The Great American Hamburger & Soda Fountain Restaurant was located there in the 1970s. A competing mall, Century Plaza, anchored by Sears, JC Penney, Pizitz and Rich's, opened across Crestwood Boulevard and Oporto-Madrid Boulevard in 1975. In 1989, Eastwood Mall recieved a facelift, adding a food court with a large glass skylight and a wall of video screens. Books-A-Million came to the mall and the Parisian store was enlarged. The cinema, however, closed. Eastwood Mall was once one of the leading malls in Birmingham, remaining enormously successful for 30 years and continuing to hold its own in the 1990s. No longer able to compete with larger malls, and facing decline in the Irondale area plus the bankuptcy of Service Merchandise, the mall began to fade after 2000 and was finally closed in 2004, with the remaining anchor, Parisian, closing a year later. Wal-Mart bought the property from Lehman Brothers (the last owner of Eastwood Mall), and built a Wal-Mart Supercenter on the site as part of the Eastwood Village shopping center constructed by MAP Development. Demolition of empty outbuildings began in May 2006. On June 29, 2006 Mayor Bernard Kincaid swung a hammer into the plate glass doors at the main atrium entrance to symbolically begin demolition of the main building. The new Wal-Mart opened in October 2007. Inside the "Retail Center" entrance of Wal-Mart is a historical tribute to Eastwood Mall that contains a brief history of the mall, as well as several photos. The display was the work of Friends of Eastwood Mall in cooperation with Wal-Mart. Many Eastwood Mall fans, as well as the Friends of Eastwood Mall, hope to see an official historical marker placed on the site of Eastwood Village honoring Eastwood Mall. This page was last modified on 31 December 2018, at 10:10. This page has been accessed 26,928 times.